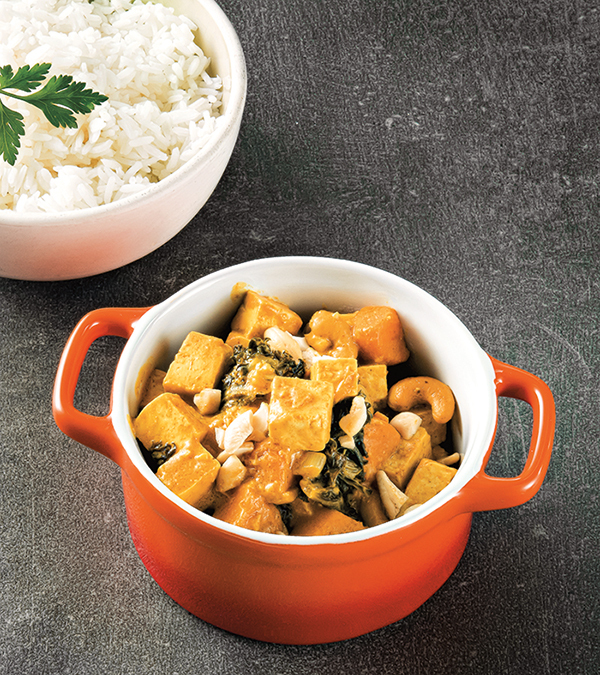 Tofu and vegetables are drenched in a flavorful Coconut Peanut Curry sauce in this recipe from From the Kitchens of YamChops! The term “vegan butcher” might sound like an oxymoron, but it is indeed a thing, and it’s a good thing at that. In these shops, you’ll find the same types of foods that you’d be able to get a butcher’s or a deli. But of course, these foods are made the cruelty-free way with plant-based ingredients. Vegan butchers have been popping up here and there, with the first one in North America being Toronto’s YamChops. Despite living in a vegan friendly area, I don’t have a vegan butcher anywhere near me. Fortunately though, Michael Abramson shares the secrets behind his incredible “meats” in his new cookbook From the Kitchens of YamChops. 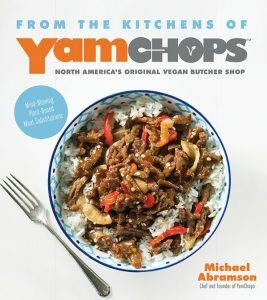 In From the Kitchens of YamChops, you’ll learn a variety of techniques to achieve meat-like texture and taste at home, all with fresh and minimally processed ingredients, such as beans, wheat gluten, tofu, mushroom, carrots, coconut, and yes, yams. 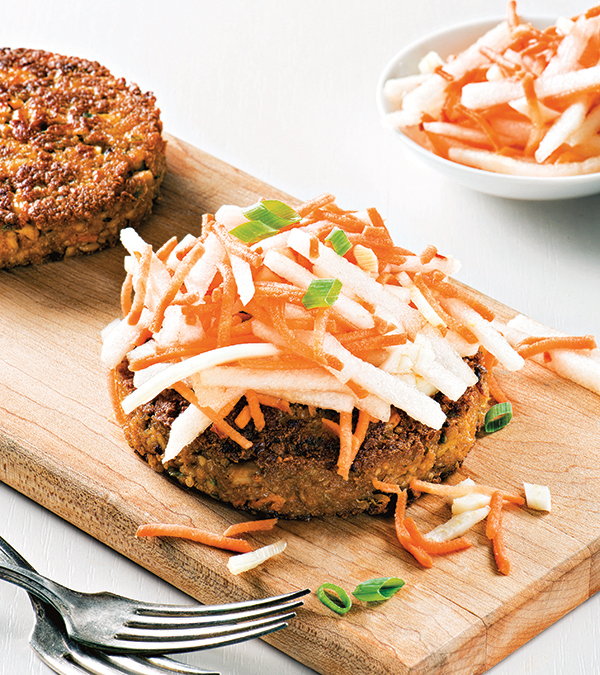 Recipes include Ba-con 4 Ways, Carrot Lox, Pinto Bean Cutlet, Seitan Loaf, and Plant-Based Chick*n.
Of course, you’ll also find recipes for a variety of different kinds of vegan staples such as veggie burgers and meatballs. There are recipes for “fish” using tofu or hearts of palm, and there’s also a No-Crab Crab Cakes recipe. I know some people might refer to the foods found inFrom the Kitchens of YamChops as “fake meat.” I really dislike that term. There’s nothing “fake” about these foods. They’re made from whole food ingredients, and they’re 100% edible. Using the term fake implies that the non-vegan versions of food are the only “legitimate” version, and everything else is a knock-off. The word “meat” comes from the old English word “mete,” which was used to describe anything edible and to differentiate what could be chewed from what could be drunk. So no, omnivores can’t lay claim to the word “meat” and vegan food is most definitely not fake. Once you’ve made your “meat,” you’ll find plenty of recipes to use them in. There are Fishless Tacos, Hunan Dumplings, and Szechuan Beef. You’ll also find recipes that don’t require pre-making your protein, such as the General Tso’s Tofu and Pulled BBQ Jackfruit and Carrot. There are plenty of deli staples in From the Kitchens of YamChops too, such as Tunaless Tuna Salad, Eggless Egg Salad, and potato salad. There are recipes for sides, salads, and sauces, as well, and there’s also a chapter devoted to chocolate desserts. If you’re missing all of the deli foods you used to enjoy in your pre-vegan days or if you want to recreate some of your favorite meaty dishes with plant-based ingredients, From the Kitchens of YamChops is the book for you! Sometimes, to get through winter up here in The Great White North, we need something that warms us from the inside out! This curry does just that. It’s thick, rich and delightfully spiced. Serve this wonderful curry over brown or jasmine rice. Heat the oil over medium heat in a Dutch oven or soup pot. When the oil is hot, add the onions, garlic and ginger. Sauté until soft, approximately 4 to 5 minutes. Reduce the heat to low and stir in the peanut butter, curry paste, turmeric and cumin. Stir until the peanut butter has melted and the mixture is very fragrant. Whisk in the water, coconut milk, sugar and salt. 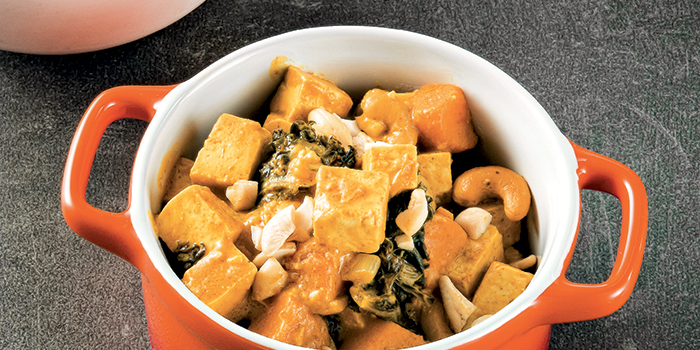 Cut the tofu into ½-inch (13-mm) cubes and add to the pot along with the sweet potato cubes. Tear the kale into bite-size pieces and add to the pot. Mix well and let the curry simmer until the sweet potatoes are tender, approximately 30 minutes. Stir the curry regularly. When ready, remove the curry from the heat and stir in the lime juice and cashews. Reprinted with permission from From the Kitchen of YamChops by Michael Abramson, Page Street Publishing Co. 2018. Photo credit: Vincenzo Pistritto. Photos by Vincenzo Pistritto Photo. Review reprinted with permission from Dianne’s Vegan Kitchen.